Hypoxia inducible factor-1 has been identified as a potential target to overcome hypoxia-induced radioresistance The aim of the present study was to investigate whether selective HIF-1 inhibition via small interfering RNA (siRNA) targeting hypoxia-inducible factor 1α (HIF-1α) affects hypoxia-induced radioresistance in HT 1080 human fibrosarcoma cells. HIF-1α expression in HT 1080 human fibrosarcoma cells in vitro was silenced using HIF-1α siRNA sequence primers. Quantitative real-time polymerase chain reaction assay was performed to quantify the mRNA expression of HIF-1α. HIF-1α protein levels were studied by Western blotting at 20% (air) or after 12 hours at 0.1% O2 (hypoxia). Cells were assayed for clonogenic survival after irradiation with 2, 5, or 10 Gy, under normoxic or hypoxic conditions in the presence of HIF-1α-targeted or control siRNA sequences. A modified oxygen enhancement ratio (OER´) was calculated as the ratio of the doses to achieve the same survival at 0.1% O2 as at ambient oxygen tensions. OER´ was obtained at cell survival levels of 50%, 37%, and 10%. HIF-1α-targeted siRNA enhanced radiation treatment efficacy under severely hypoxic conditions compared to tumor cells treated with scrambled control siRNA. OER was reduced on all survival levels after treatment with HIF-1α-targeted siRNA, suggesting that inhibition of HIF-1 activation by using HIF-1α-targeted siRNA increases radiosensitivity of hypoxic tumor cells in vitro. Inhibition of HIF-1 activation by using HIF-1α-targeted siRNA clearly acts synergistically with radiotherapy and increase radiosensitivity of hypoxic cells in vitro. 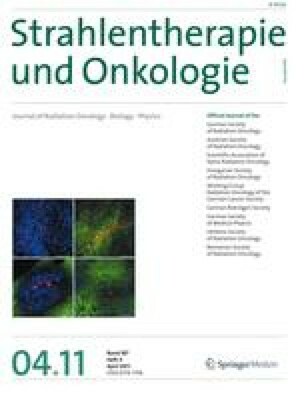 Hypoxia-inducible Factor-1 (HIF-1) wurde als potentielles therapeutisches Target identifiziert. Ziel der Arbeit war es, zu untersuchen, ob die selektive HIF-1-Inhibition mittels Small Interfering RNA (siRNA) gegen HIF-1α die Strahlensensibilität von hypoxischen HT-1080-Zellen beeinflussen kann. Die HIF-1α-Expression in humanen HT-1080-Fibrosarkomzellen wurde mittels RNA-Interferenz nach Transfektion der Zellen mit siRNA unter hypoxischen Bedingungen (0,1%, O2, 12 h), bzw. Normoxie (20% O2) in vitro inhibiert. Die HIF-1α-Genexpression wurde mit quantitativer Realtime-Polymerasekettenreaktion (qRT-PCR), das HIF-1α-Protein mittels Western Blot quantifiziert. Das klonogene Überleben wurde nach Bestrahlung unter Hypoxie und Normoxie bestimmt und daraus eine Oxygen Enhancement Ratio (OER´) bei den Überlebensniveaus 50%, 37% and 10% berechnet. HIF-1α-siRNA erhöht die Strahlensensibilität unter hypoxischen Bedingen, verglichen mit HT-1080-Zellen, die mit Kontroll-siRNA behandelt wurden. Die OER` war bei allen Überlebensniveaus reduziert. Eine selektive Inhibition der HIF-1-Aktivierung durch HIF-1α-siRNA wirkt synergistisch mit einer Bestrahlung und erhöht die Strahlensensitivität hypoxischer Tumorzellen in vitro.